We have introduced new methods to determine rapidly on a regional to global scale the tsunami potential and magnitude of large earthquakes (e.g., Lomax and Michelini, 2009ab, 2011, 2012). To validate these methods we have tested them on 120 large earthquakes (6.4 ≤ Mw ≤ 9.1) and implemented them along with other new algorithms within the Early-est earthquake monitor at INGV-Rome. 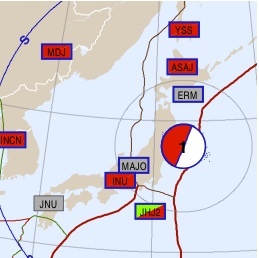 Early-est is a lightweight software package for real-time earthquake monitoring (including phase picking, phase association and event detection, location, magnitude determination, first-motion mechanism determination, ...), and for tsunami early warning based on the TdT0 and TdT50Ex discriminants for earthquake tsunami potential. In a simulation using archived broadband seismograms for the devastating M9, 2011 Tohoku earthquake and tsunami, Early-est determines: the epicenter within 3 min after the event origin time (OT), discriminants showing very high tsunami potential within 5-7 min, and magnitude Mwpd(RT) 9.0–9.2 and a correct shallow-thrusting mechanism within 8 min. Real-time monitoring with Early-est gives similar results for most large earthquakes using currently available, real-time seismogram data. Early-est at INGV is managed by Valentino Lauciani. This work is supported by INGV - Centro Nazionale Terremoti institutional funds and by the EC n.262330 NERA 2010-2014 project. INGV (ingv.it), IRIS DMC (www.iris.edu), GFZ Data Archive (geofon.gfz-potsdam.de) and GEOSCOPE (geoscope.ipgp.fr) provided access to waveforms used in this and cited studies.